Volunteers are needed in Pokhara to take photographs and films which can be used in promotional activities for the charity portfolio, fundraising and marketing. Volunteers will be involved in capturing images and film of the local people, area and lifestyle in the Himalayan city of Pokhara. Volunteers get involved in working directly with the young people at the street children’s centre, orphanage and women’s refuge. Volunteers can share their skills with the local children by working with other volunteers to create plays, shows and short films with the children which they thoroughly enjoy being part of! The interaction with volunteers naturally improves the children’s English. Photographs and film are incredibly valuable since they provide a direct link between the community and supporters and help the charity to document donations and grants. Volunteers have the opportunity to contribute to our PoD Nepal and PoD Charity blog and cover issues such as news updates, community development, travel and volunteering. Volunteers usually work five days per week for around four hours per day. Volunteers are able to get involved with child care, sports coaching and creative arts roles within the Pokhara too. You will work with the volunteer manager in Nepal as well as independently to capture images and clips. To volunteer you will need your own equipment and slef motivation for this volunteer placement. Volunteers spend afternoons at the street children’s centres or orphanage and during the day volunteer at child care centres or schools. All PoD Nepal volunteers can also join our Friday volunteering group where we organise for the team to volunteer in Pokhara led by Chrissy, our PoD volunteer manager. Volunteers receive a Nepali language lesson in their first week in Nepal. There will usually between 2 and 5 other PoD volunteers in Pokhara at the same time as you, though there may be less or several more. You can also combine volunteer placement with our Child Care,Teaching, Creative Arts and Sports projects which are based in the same location in Pokhara. PoD has been in Nepal since 2007 and we support projects through volunteers as well as financial support through the PoD Charity. PoD has two members of staff who are based in Pokhara. Chrissy is our volunteer coordinator and she is the first point of call for volunteers and she will be there to support you throughout your time at the project. 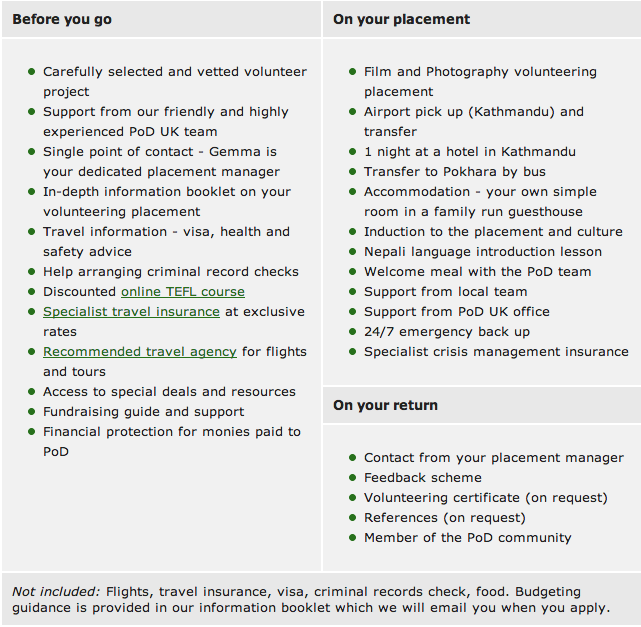 Phil is our local Nepali placement manager and he will introduce you to your placement. The PoD team support your work through regular team meetings and by being available for informal one to one support when needed. The schools we work with in Pokhara are all government funded and have limited resources. The Street Children's Centre rescues children from a life on the street. The children here could have run away from home, be abandoned by their families or have grown up on the streets as orphans. The centre provides safe accommodation and basic food for the children; it works with other orphanages and small organisations in the area to seek educational sponsorship for the children. The orphanage is home to around 15 orphaned children who are aged between 4 and 16 years old. The orphanage uses its limited resources to provide the children with accommodation, food, education and support. Film and photography volunteers in Nepal are based in Pokhara which is a beautiful city in the Himalayas situated by a tranquil lake. Volunteers live in the area of Lakeside which is in close proximity to restaurants, internet cafes and shops. This project location is ideal for those wanting to relax and admire the surrounding mountains and is also perfect for anyone wanting to explore the Himalayas after their time volunteering. Pokhara is the base for many adventure activities including paragliding, white-water rafting, kayaking and trekking.